Earlier this month, three members of our organization, Semilla Nueva, participated in the national conference on extension and research hosted by The International Maize and Wheat Improvement Center (CIMMYT), the Mexican government and the Food and Agriculture Organization of the United Nations in Texcoco, Mexico. The conference was in honor of the FAO’s 2014 International Year of Family Farming. What’s at stake – in simple terms? By 2050 there will be more than 9 billion people on the planet, and we have to feed them. Across Latin America, the majority of the region’s farmers are family farmers, producing just enough to feed themselves. Latin America has the land, the people and the infrastructure to become a major source of food for the rest of the world, and in the process pull millions out of poverty. But as Bram Govaerts, CIMMYT’s Deputy Director of the Global Conservation Agriculture Program, explained, there is the potential to feed the world – but we can’t eat potential. Farmers, politicians, scientists, businesses and nonprofits all have to make the choice, every day, to turn that potential into reality. Gloria Abraham, Mexico’s representative for the Inter-American Institute for Cooperation on Agriculture (IICA) – and the first female Minister of Agriculture in all of Central America – gave a great overview of the panorama of our biggest challenges and opportunities. As Abraham explained, family farms in Mexico and Central America average five acres, and most of these produce only enough to feed themselves. The central challenge is helping these subsistence farmers use their five acres to become small businesses and engines of the local economy. Farmers need to choose crops that are profitable, even if this means changing from crops they have traditionally grown. Farmers need business skills. A farmer who can’t calculate costs and profit will have a hard time identifying good opportunities and will instead rely on tradition and offers from middlemen. Farmers need to learn how to market their crops. Today, too many farmers simply concentrate on maximizing production of crops they are most accustomed to growing, then rely on a middleman to arrive and purchase their crops. Becoming a business involves looking beyond the field to the market. Farmers need to organize. Without farmer organization they will never have the collective voice to ask for the technical assistance and support needed to make this transition. This means changing how they explain and understand their situation – and how they vote. This means we have to help farmers organize and ensure their vision for the future is feasible and clear. And this was the focus of the conference. If we know how farmers need to change, how do we, as the organizations tasked with supporting farmers, have to change? Our guiding principle came from Jorge Galo Medina, the General Director of Capacity Development and Rural Extension at México’s Ministry of Agriculture. He presented an incredibly appropriate metaphor for Latin America. Team members of Barcelona (one of the world’s greatest soccer teams) are trained to pass to teammates who are, in turn, in a position to pass the ball to yet another teammate. In other words, every play has to have at least a few teammates in mind and be executed at the moment when they are all lined up. I’ve worked in agricultural development for six years now. Getting farmers to organize feels like herding cats. Getting nonprofits, companies, government agencies and others to organize feels like herding cougars, i.e. really big cats. But this is our fundamental challenge. We need scientists to respond to the needs of very specific regions. They can only do this if they are being connected with the people working with farmers in that region. We need business experts to help farmers with very specific challenges. They will only be able to do that if they are connected in the same way. We need a system that continually facilitates collaboration between dozens of different organizations and actors in a very intimate and long-term way (not simply attending each other’s conferences and knowing each other’s names). Knowledge needs to easily flow in both directions and decisions need to be made more often as a group. And this is going to be hard. I think we can meet our fundamental challenge of feeding the world only if we change our culture, rather than just making official agreements between our organizations. Our different organizations compete for funding and prestige. Many of the nonprofit directors I know are far more competitive than business CEOs. But we need to change how we compete. Rather than competing in how well we work on our own, we need to compete in how well we can work together. It isn’t just which organization or political party has helped the most communities, although this is important. We need to judge the success of organizations by how far they participate and lead in the creation of a more collaborative and successful system of research and farmer training. This is an enormous change in mindset, and it will require changes not just in farmers and organizations, but also in international funding organizations and local voters. We can sound the alarm. We can do a lot. But it will require these two huge forces to change how they think if we want to make real long-term change. Semilla Nueva is already working to create links between farmers, development organizations, international research organizations and local governments. 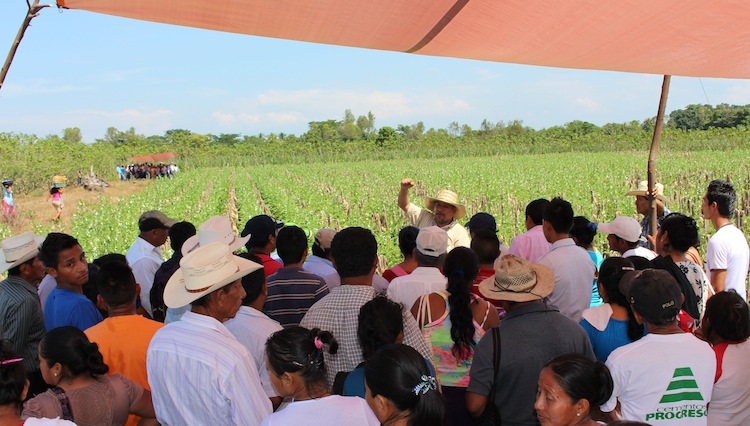 You can read more about our efforts connecting international organizations like CIMMYT with Guatemalan farmers and Guatemalan researchers here. Curt Bowen is Executive Director and Co-Founder Semilla Nueva.